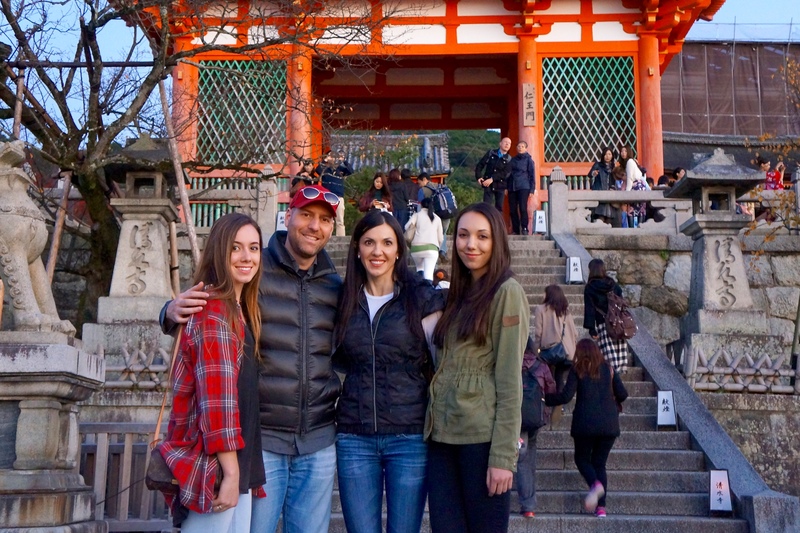 Visiting Kyoto is a great way to experience traditional Japan. We took the bullet train from Tokyo to Kyoto. The trains are very punctual, fast (200mph) and have forward-facing comfortable seats. We never felt ‘lost’ in the train station since there were several English speaking attendants working, who were able to help us with directions. It would be more difficult once out and about the streets of Kyoto since everything is written in Japanese! Luckily, we hired a private driver/tour guide, who made it possible for us to get around without any worries. The concierge at the Park Hyatt Tokyo scheduled the private driver for us. 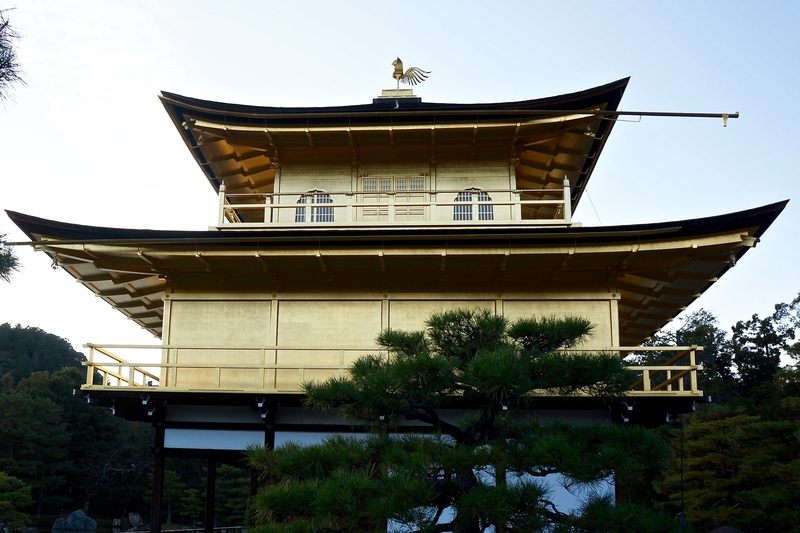 Kyoto was the old capital of Japan with literally thousands of shrines and temples. Way too many to see in one day! Though, we did see several, each unique, which helped us better understand some aspects of the culture of the Japanese. The two main religions in Japan are Shinto and Buddhism and people seem to adhere to them both, which co-exist and complement each other. 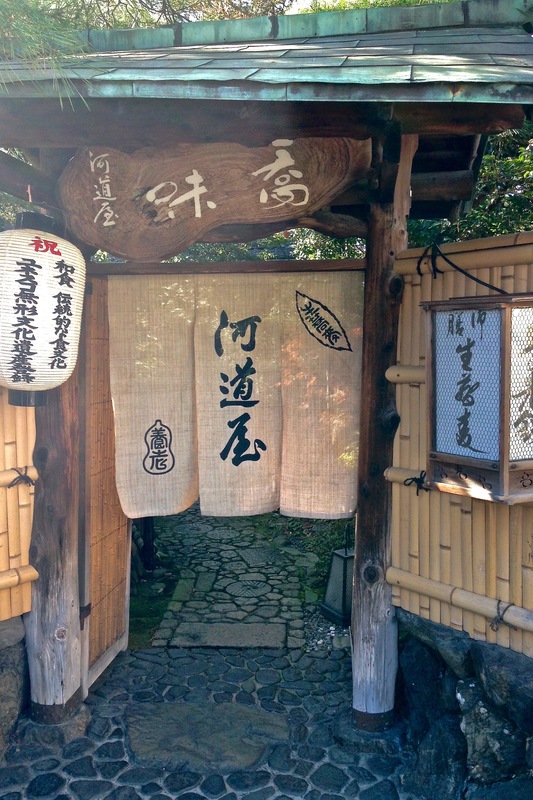 Shinto is the indigenous faith of Japan, dating back to the 8th century. Buddhism was brought from South Asia between the 4th and 6th century. 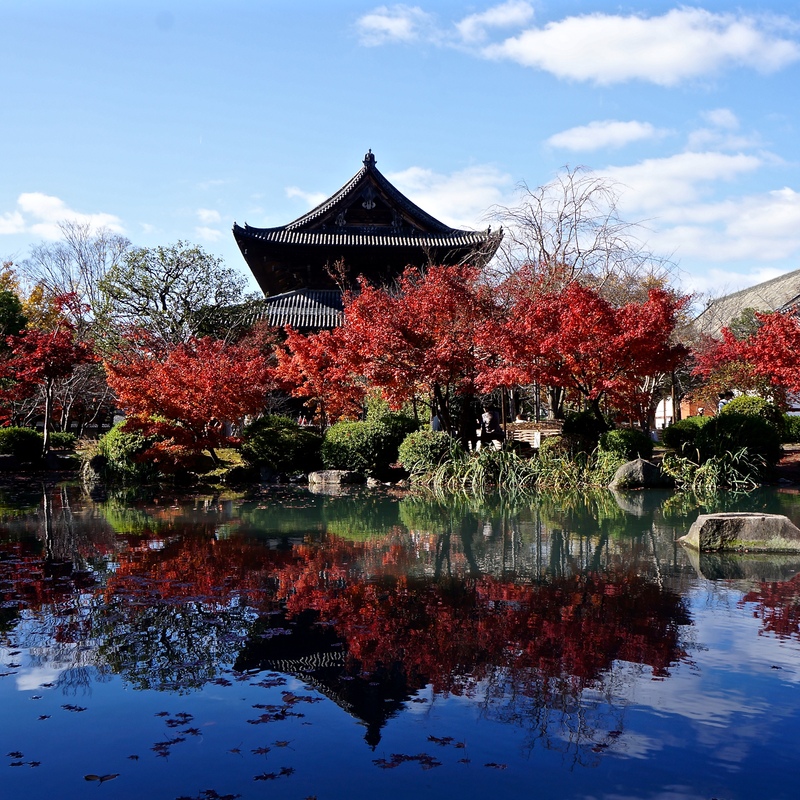 I loved the gardens at the Toji Temple with the reflecting koi ponds and vivid fall foliage! The temperature was ideal for walking around the tranquil grounds. 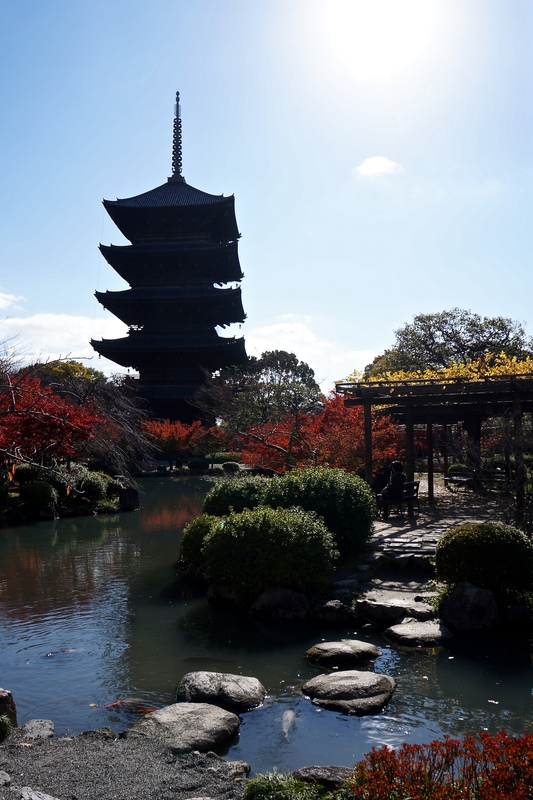 The five-storied pagoda at Toji Temple is the highest in Japan at 187 feet. It burned down four times after being struck by lighting…what bad karma! The current pagoda was built in 1644. It houses images of the Four Buddhas and their followers, the eight great Bosatsu. 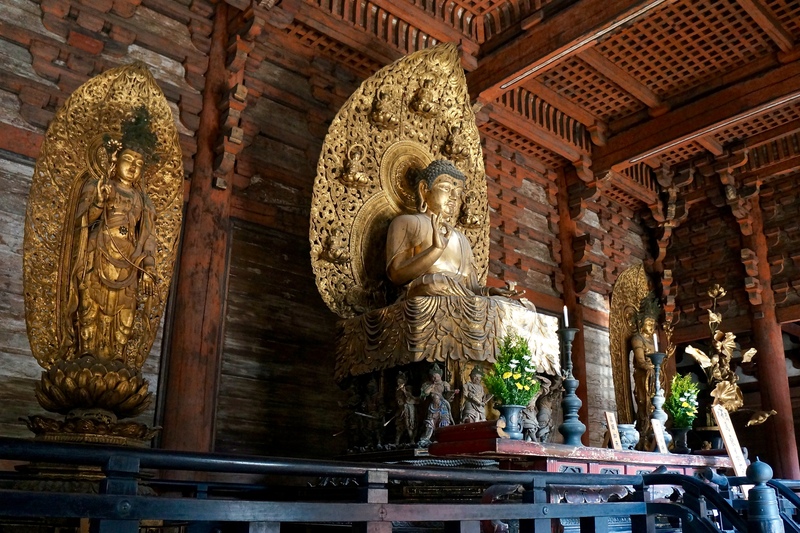 Toji is a treasure house of Esoteric Buddhism art, due to its large number of cultural assets brought back from China, including old Buddhist statues, carvings and paintings. The statue of Yakushi (1603), the Buddha of Healing, is located in Kondo Hall. It is flanked by statues of Nikko (Sunlight Bodhisattva) and Gakko (Moonlight Bodhisattva). 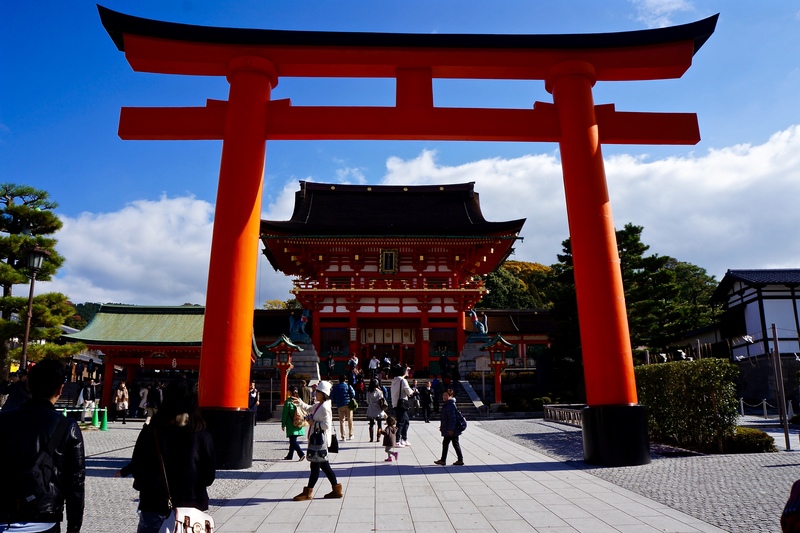 Next we went to the most famous Shinto shrine in Japan, Fushimi Inari Taisha with cheerful orange torii gates. Once inside, practically everything else was painted orange too! The shrine sits at the base of Inari Mountain (764 above sea level) and includes trails up the mountain to many smaller shrines which span around 2.5 miles and takes approximately 2 hours to walk up. This shrine was dedicated to the gods of rice and sake by the Hata clan in the 8th century. 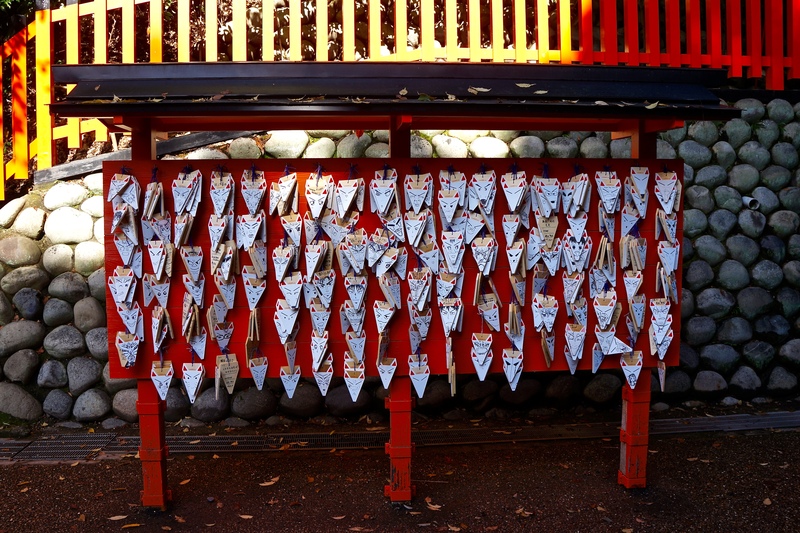 Ema are wooden plates where people leave their wishes in the hope that they will come true. The above ones also came with “fox heads” for people to draw in faces. Fushimi Inari Taisha -Shinto shrine…the 2005 movie, “Memoirs of a Geisha” was filmed here. Since early Japan, Inari was seen as the patron of business, and merchants and manufacturers have traditionally worshipped Inari. 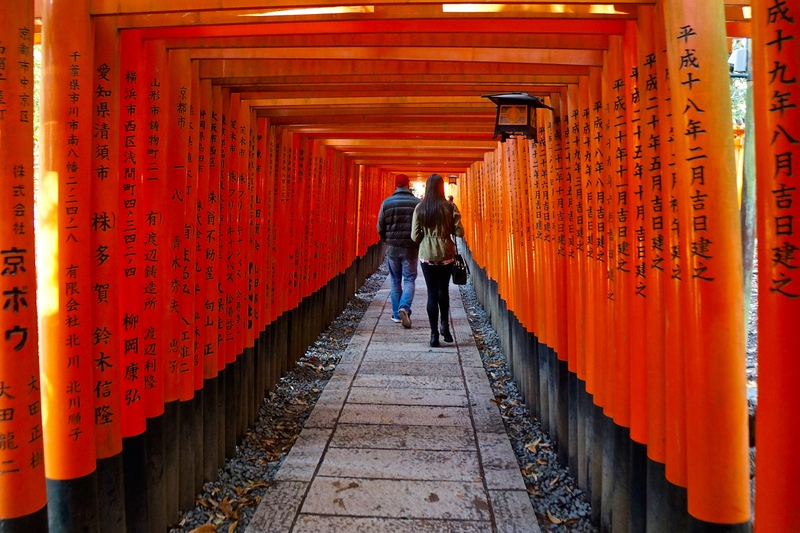 Each of the torii at Fushimi Inari Shrine is donated by a Japanese business. The seemingly unending path of about 10,000 vibrant torii gates, that wind through the hills behind Fushimi Inari-taisha Shrine, made for a fun walk up the hill. 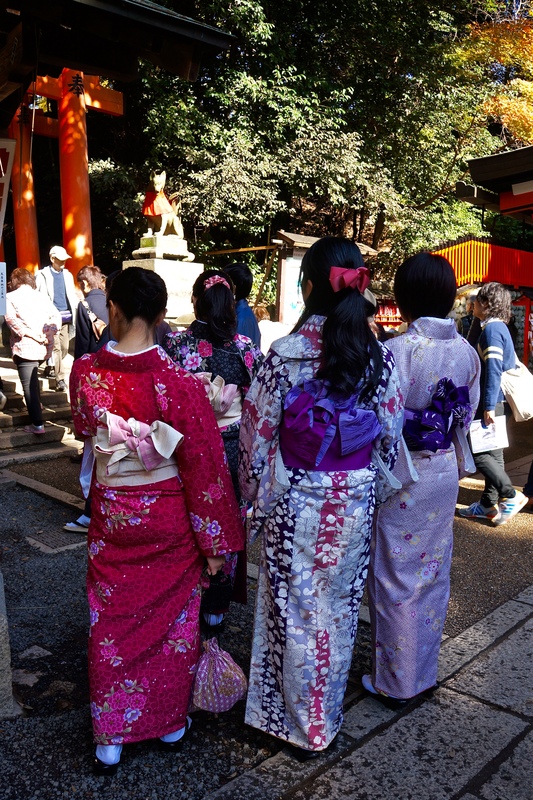 These colorful kimono-clad young girls were waiting their turn to make their offering at the shrine to pray. This is usually done by throwing a coin into the box as an offering, bowing deeply twice, clapping twice, bowing again and then praying. 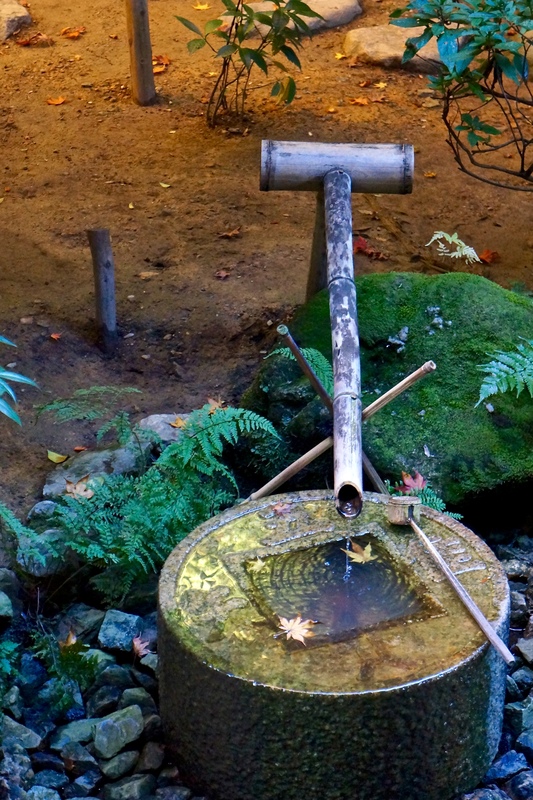 Often there is a gong which may be used before praying to get the kami or Shinto gods’ attention. Gonging sounds fun…I don’t think I’d get past that first step!! Next, we went to Nishi Hongwanji temple, that is the headquarters of the Hongwanji denomination of Jodo-Shin Buddhism and one of the most influential schools in Japan. The grounds have several huge Ginkgo Biloba trees, also known as “maidenhair trees”, which are one of my favorites. 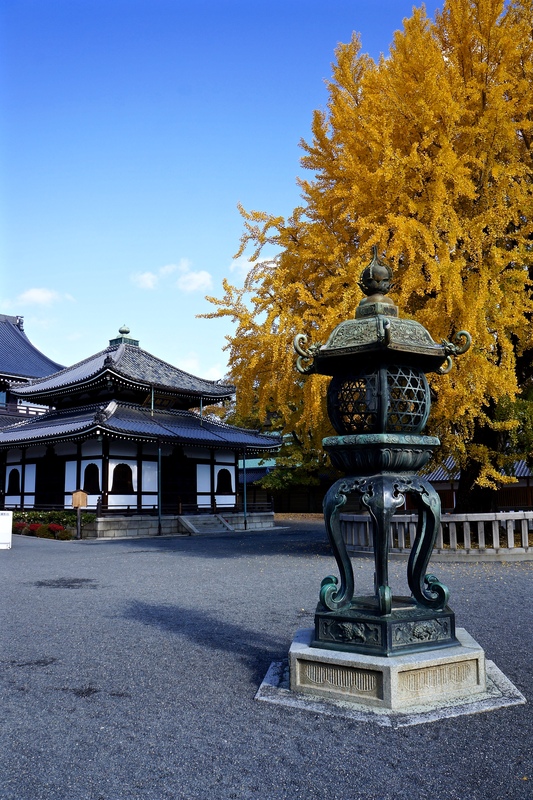 They were in full show, with their golden leaves, glowing against the neutral shades of the temple grounds! I loved the architectural aspect of these temples, from the curves in the roofs, to the contrast of the white exterior walls with the dark grays/black trim and tiled roofs. It is considered one of the finest examples of Momoyama style architecture in Kyoto. 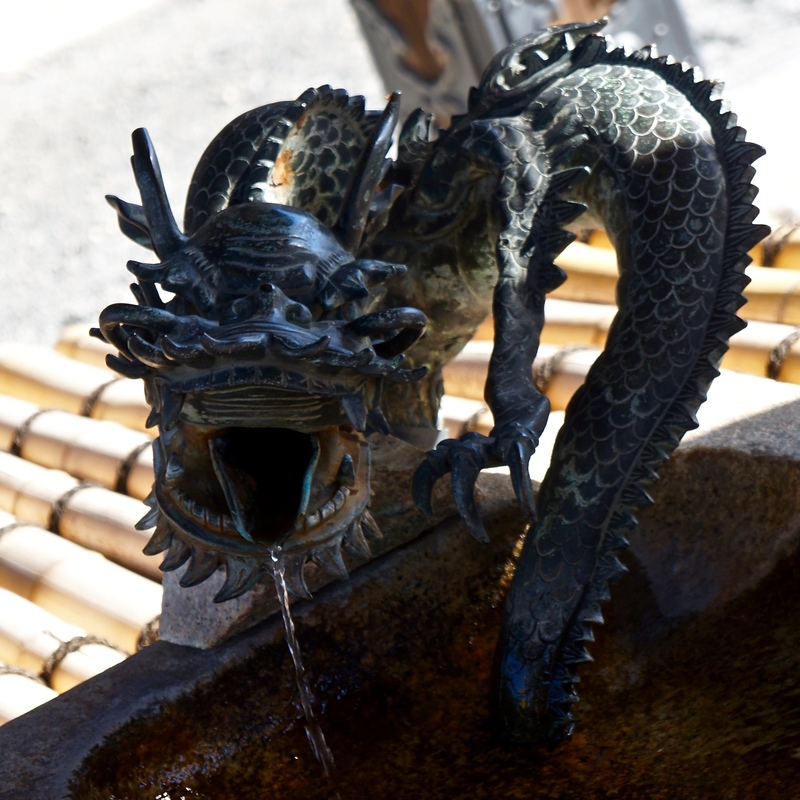 In the courtyard was a bronze dragon water fountain that I’d love to have in my yard! After a great morning of shrine and temple hopping, it was time for lunch. Our driver/tour guide dropped us off at a neat old traditional Japanese soba noodle shop, Kawamichiya-yoro, that’s been around since 1910. We also had to take off our shoes before entering the restaurant. We were seated at a “sunken” table, overlooking a quiet garden that opened behind us. 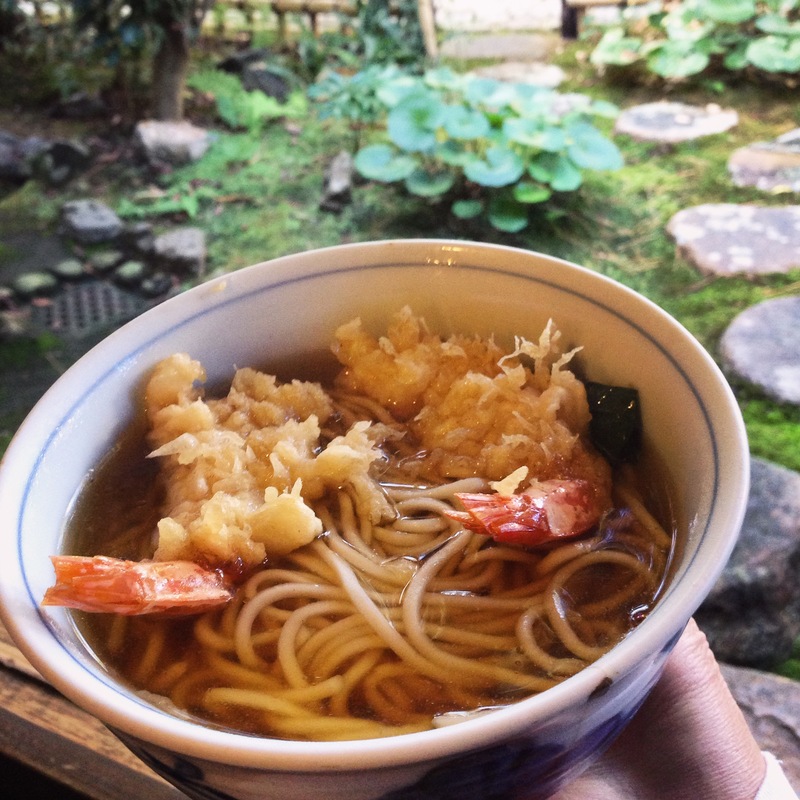 It was a fun, cultural experience with tasty soba noodle soup and tempura shrimp on top! Then, off to more unique shrines and temples. 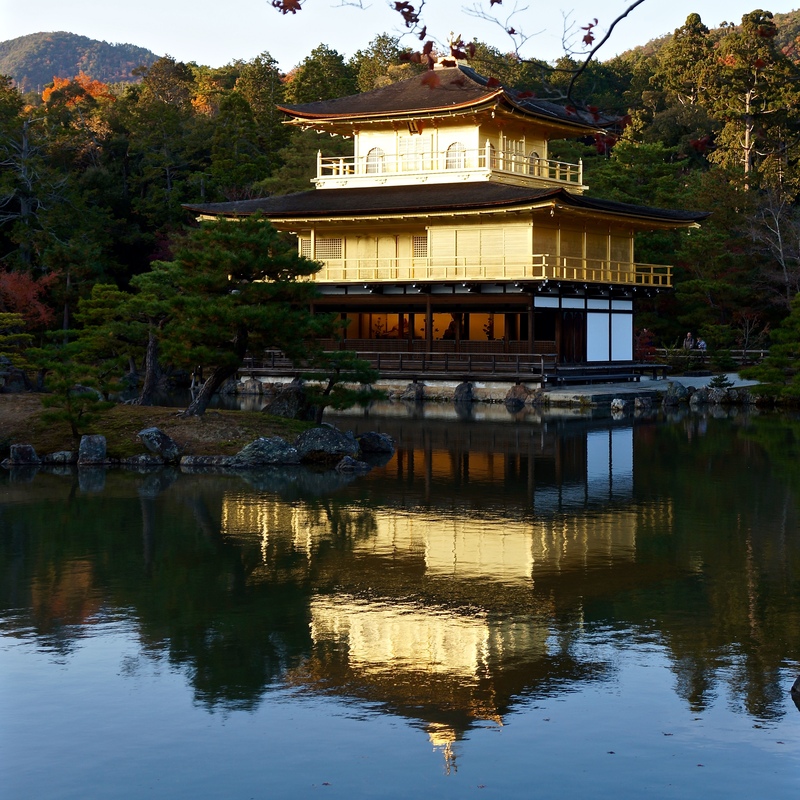 In northern Kyoto, the Golden Pavilion (Kinkakuji), which became a Zen temple, was stunning during early sunset. This was a very crowded site, since everyone there wanted a picture of the glowing temple. It burned down several times throughout its history due to wars and once again in 1950 when it was set on fire by a fanatic monk. The present structure was rebuilt in 1955. You can see the squares of the gold leaf in the picture above. They look to be perfectly applied, which must have taken many tedious hours…one would either have to practice Zen or go insane!!! 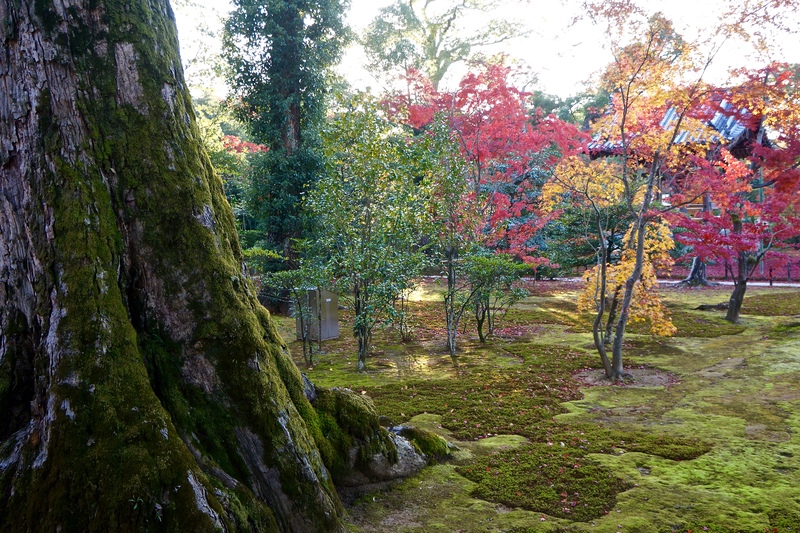 I loved all the soft-looking moss covering, under the shade of these vintage looking trees! The gardens at Ryoanji Temple were very well maintained and the tourists were respectful to only walk on the paths. This simplistic Zen rock garden is a relaxing contrast from the rest of the gardens that are lush and colorful. 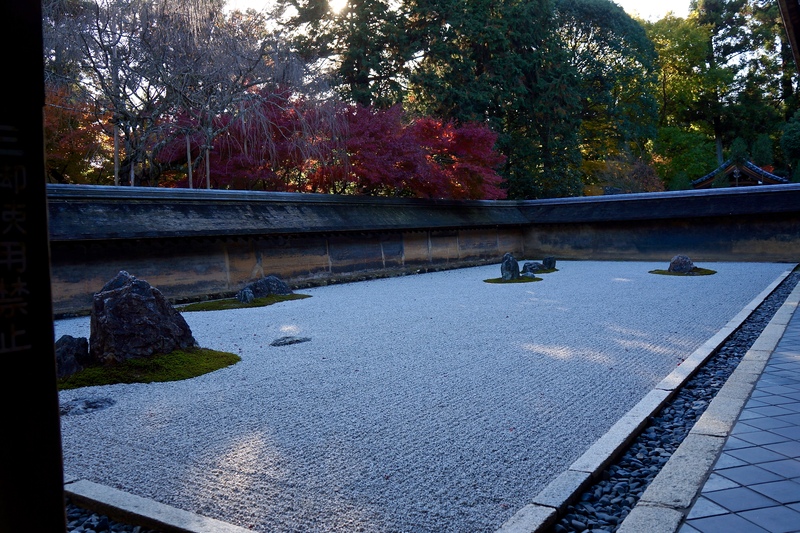 A Zen monk built it using only 15 rocks and white gravel. The walls were made out of clay boiled in oil, which with time has seeped out, changing the appearance of the original wall. We did a very fast walk through Sannen-zaka and Ninen-zaka District. 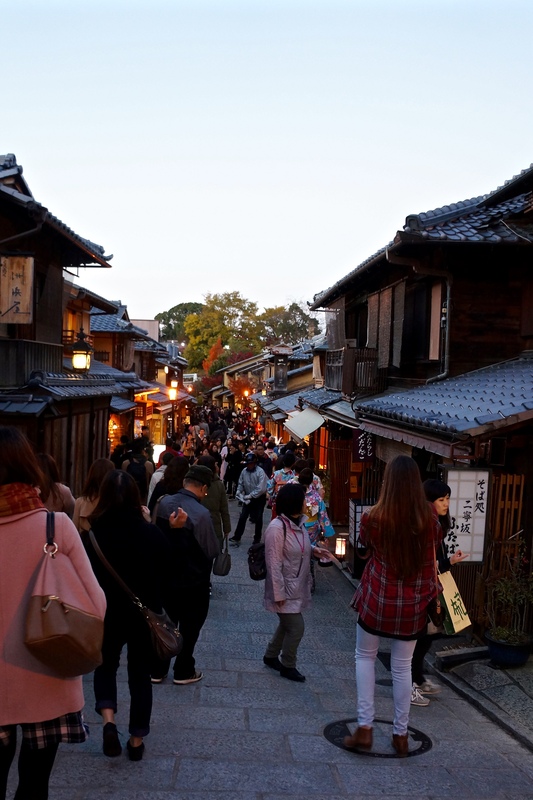 It’s the well preserved old part of Kyoto, lined with gift shops, teahouses and restaurants on both sides of these streets. There were soooo many people!! We were dodging left and right as our guide expertly maneuvered us at a rapid pace through the sea of people. It would be a great place to experience what Kyoto looked like before modernity descended in full force. Just try to go when it’s not so crazy busy! We made it as far as Deva gate, the entrance to Kiyomizu-dera Temple. We ran out of time to explore the grounds since we needed to get back to train station for our return to Tokyo. All in all, we had a great first time visit to Kyoto. It was worth the extra money for the private driver/tour guide. He knew just where to go, at what times places closed and how to get around traffic congestions. We had our hotel concierge at the Park Hyatt Tokyo help us with arranging the private driver/tour guide, which I highly recommend.